If your basement flooded once, it can happen again. Fortunately, there's a lot you can do to prevent a flooded basement. That's where we come in. As a basement waterproofing company, Ayers Basement Systems offers solutions that will ensure that your basement stays dry. Call us today at 1-844-262-2971 or click below to learn more about how we can help you solve your basement flooding problems. We offer free estimates on all our services in Lansing, Grand Rapids, Kalamazoo and the nearby areas. At Ayers Basement Systems, we have basement waterproofing products to solve all of these problems. If you have ever had a flood in your basement or are concerned about one, the local experts at Ayers Basement Systems are here to help! We provide complete basement waterproofing services, and our experts will help you identify the best solutions for your home. Call us today at 1-844-262-2971 or contact us online to learn more and get started with a free estimate! 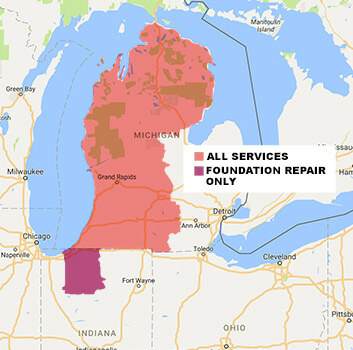 We proudly serve in Grand Rapids, Lansing, Kalamazoo, Muskegon, Battle Creek, Mount Pleasant, Jackson, Niles, Alpena, Traverse City and throughout the surrounding areas.